SINN FÉIN President Gerry Adams is in the United States this week, where he has briefed senior political figures on the political and peace process in Ireland and attended a number of events to celebrate St Patrick’s Day with the Irish American community. On Tuesday he met the U.S. Secretary of State Hillary Clinton in Washington. Adams thanked Clinton and the U.S. Administration for continued support for the Peace Process in Ireland. “The Secretary of State has played an important and supportive role in the Irish Peace Process. I had an opportunity today to thank her for that continued focus by the U.S. government,” Adams said afterwards. The meeting also allowed the Sinn Féin President to raise a number of issues, including the future of the International Fund for Ireland, which has made an important economic contribution over many years; U.S. economic support for regeneration and investment; and the need for continuing U.S. support for the Peace Process and for the political institutions. Adams also briefed the Secretary of State on the current political situation and in particular the work arising from the Hillsborough Agreement on implementing the outstanding issues from the Good Friday and St. Andrew’s Agreements. Later, Adams met U.S. Senator Chris Dodd and briefed him on the political process. Gerry Adams also raised the plight of the thousands of undocumented Irish living in the USA. “There are many thousands of undocumented Irish living and working in the USA who have built new lives and are contributing positively to that society. 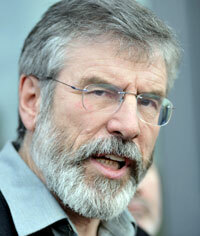 Sinn Féin supports immigration reform which would provide a visa for the undocumented Irish,” he said. During the Sinn Féin President’s U.S. trip some Irish news reports were critical of the party’s decision to attend a Clover Club event in Boston, which is male only, and the Boston St. Patrick’s Day Parade, which excludes gays and lesbians. Gerry Adams spoke for the Irish America Partnership charity at the Clover Club. Members, like current President Joe Leary, who is also President of the Irish American Partnership, do great work raising money for charitable causes, mainly in the U.S. but also for Ireland. The efforts of the Irish American Partnership have been widely applauded in Ireland for the excellent work they do on economic regeneration and education. “The St. Patrick’s Day Parade in Boston, like that in New York, is attended by the nation’s most senior local and national politicians, tens of thousands of Irish Americans, hundreds of community organisations, and representatives of the Irish Government. Irish political leaders and politicians have been coming to the USA to celebrate St. Patrick’s Day with the Irish diaspora here for a very long time. It’s about keeping the connection between home and those millions who now live in scores of countries scattered across the globe. And that’s important. 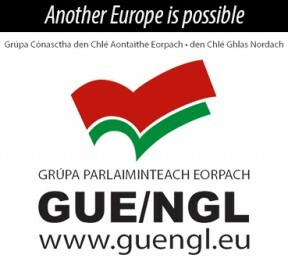 That connectiveness and solidarity with Ireland was also evident during the recent years of conflict and struggle. During that time Irish America kept the faith and remained strong and committed to freedom and justice and peace in Ireland. The fact is that there would be no Peace Process in Ireland if it were not for the active encouragement and support of Irish America and political leaders here. That support exerted influence and political pressure at key moments in the Peace Process. For example, most recently Secretary of State Hillary Clinton was on the phone to political leaders in Ireland encouraging agreement during the negotiations at Hillsborough. That investment of time and effort by the political establishment in the USA is largely down to the strength of Irish America. Sinn Féin is an Irish republican party. That means we want an end to the partition of Ireland, an end to the Union with Britain, and the construction of a new national democracy, a new republic on the island of Ireland and reconciliation between Orange and Green. Everything we do is about advancing this objective. And as with the Peace Process; in any effort to advance a United Ireland the Irish diaspora will play a crucial role, and none more so than here in the USA. So, following on from our very successful conferences in the USA last year we have held more in Canada and London and we are encouraging all those who support Irish reunification to engage in this endeavour in any way they can. This means encouraging dialogue and building political interest and pressure. This can be done in many ways either directly with political leaders, through the internet, in letters and articles in newspapers and so on. It is about putting the issue of Irish reunification on the political and popular agenda. I believe we can succeed. The Good Friday Agreement provides a means to achieving a United Ireland. For the first time there is a level playing field on which nationalists and republicans, and unionists and loyalists can play out our different positions and let the people decide. The Good Friday Agreement clearly accepts that it is for the people of the island of Ireland to determine our own future – to exercise our self-determination. In the event that a majority of people in the north prefer a sovereign United Ireland then the British government will legislate for it. The agreement also sets out the mechanism by which this will happen – by means of a ‘border poll’. So, when a majority in the north and a majority in the south opt for Irish reunification, the constitutional process to bring that about will kick in. The Good Friday Agreement, therefore, provides for a constitutional route to Irish unity. That is a significant achievement. Of course, many unionists have a different perspective. They want to maintain the Union. But it is also clear that a significant number also no longer fear the prospect of Irish unity or are as against it as was once the case. So a key priority for Irish republicans in the time ahead is to persuade unionists – or at least a section of unionism – that such a development makes political, social and economic sense – that it serves their self-interest. We need to address the genuine fears and concerns of unionists in a meaningful way. We need to look at ways in which the unionist people can find their place in a new Ireland. In other words, it needs to be their United Ireland. Let us be clear about this; the unity of our people in everyday life and the unity of this great country of ours is part of the same human endeavour.